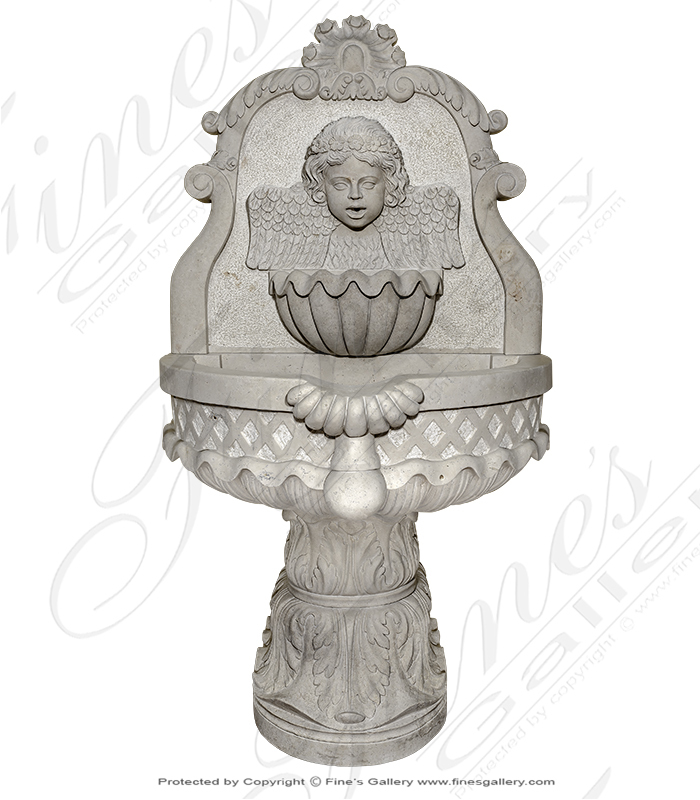 This charming old world style fountain is constructed of Sicilian Limestone imported from Italy! Available for a limited time only!! Dimensions: H: 98" W: 118" D: 118" View Colors Call Us! Dimensions: H: 120" W: 168" D: 168" View Colors Call Us! 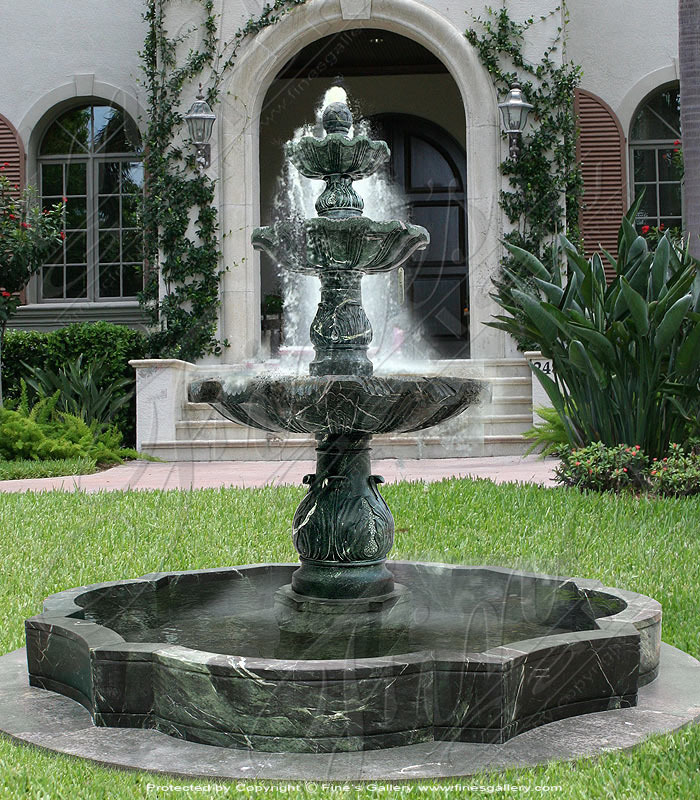 This traditional style three tiered solid granite fountain features a fluer des lis finial, four spouting lion heads and cornicopia shells which spout water towards the central feature. Add LED lighting for amazing night affect. In Production. 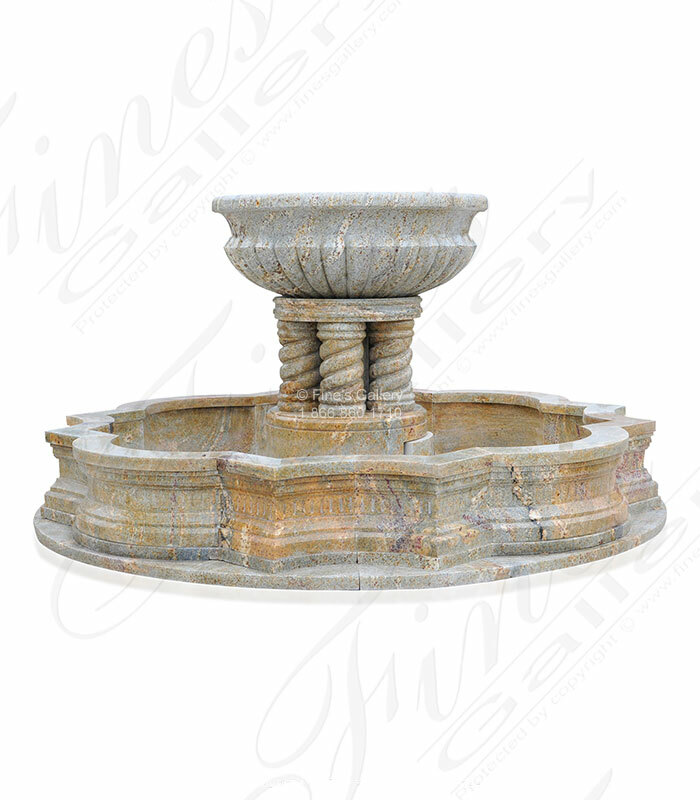 Luxury Motorcourt Granite Fountain features solid granite with traditional acanthus leaf carving throughout. 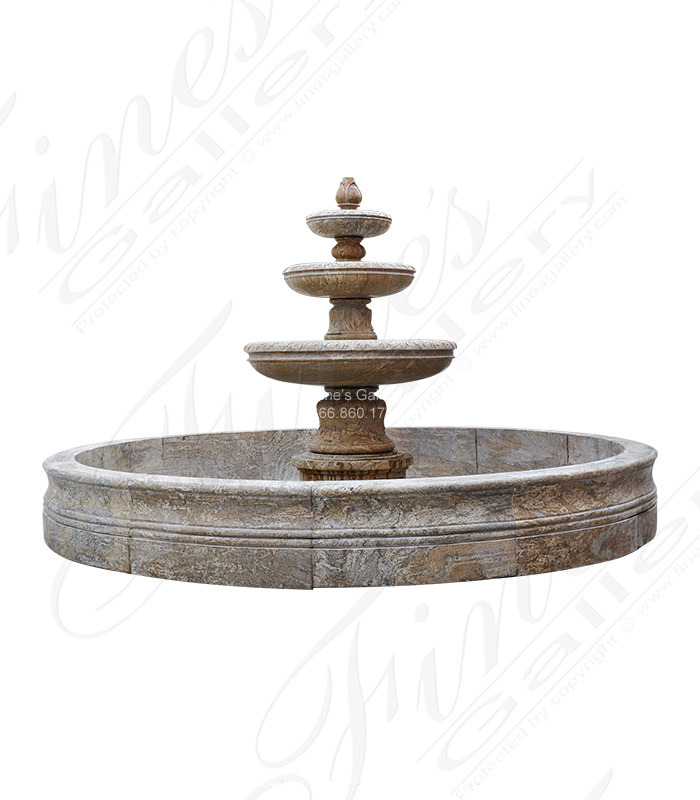 Spiral columns and a pineapple finial add to the ambiance of this Roman Inspired fontana. A Rich luxurious earth tone granite. Dimensions: H: 104" W: 144" D: 144" View Colors Call Us! 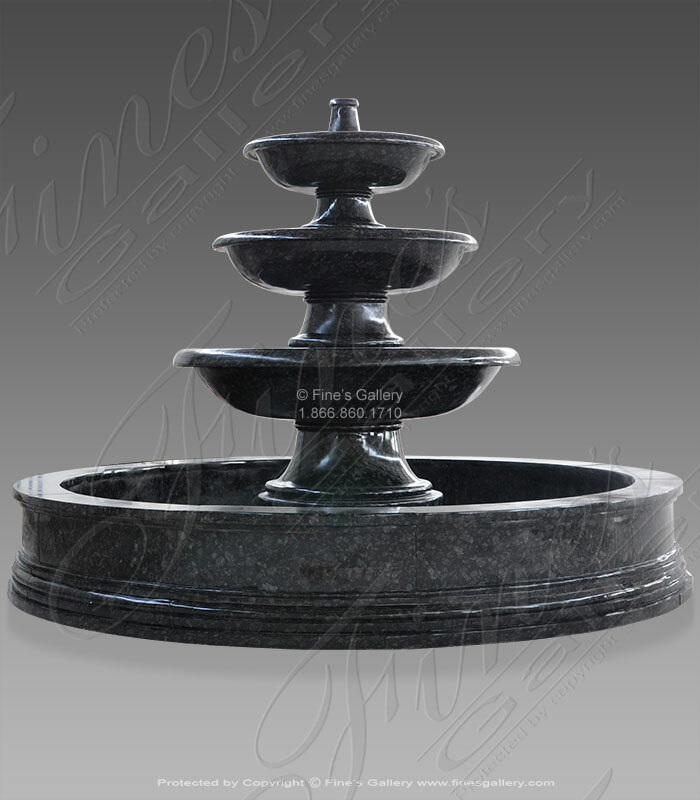 A stunning Contemporary Black Granite Tiered Fountain. 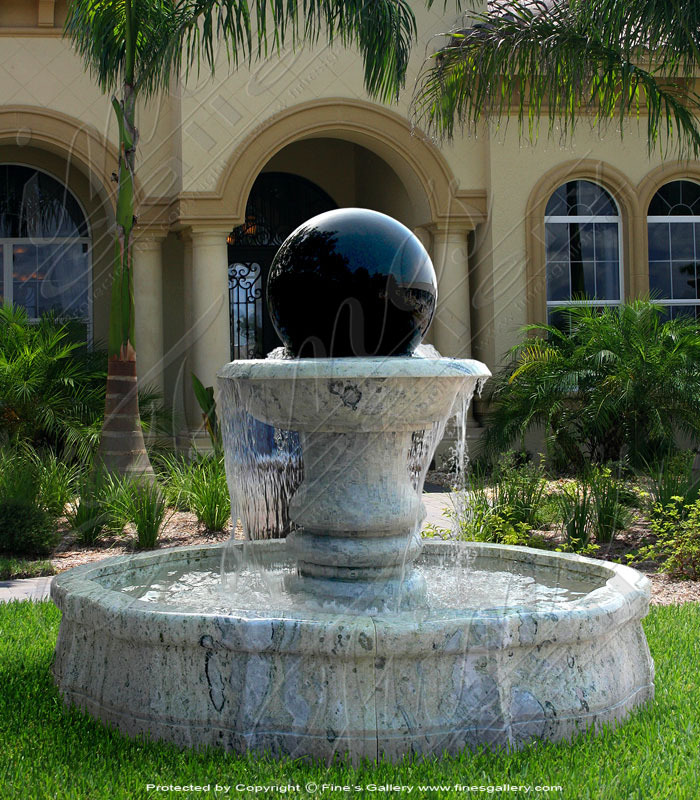 This sleek granite fountain is highly polished. Each bowl has been machined to allow for maximum high volume water effect. Rare exotic black pearl granite. Ad your hardscape as shown or modify! Dimensions: H: 78" W: 108" D: 108" View Colors Call Us! 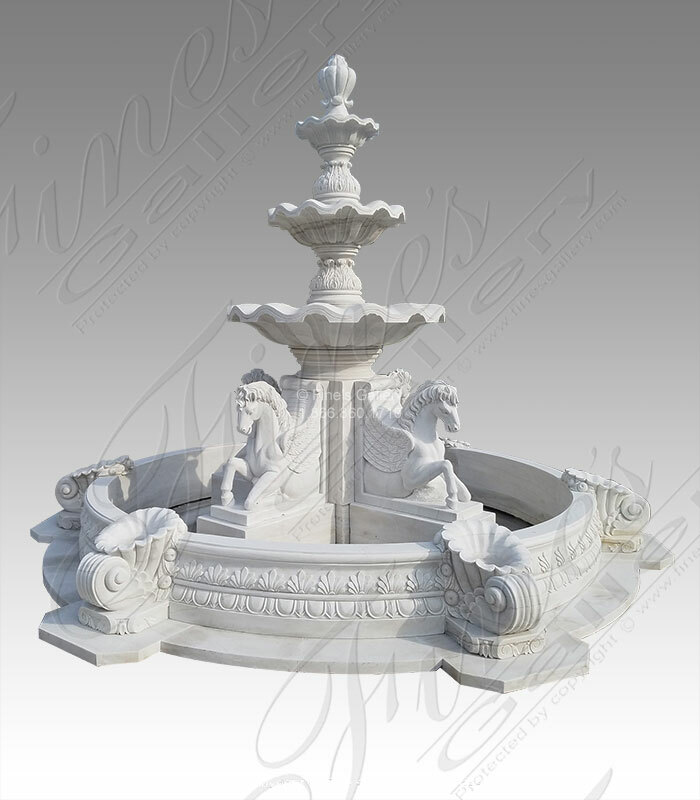 Pictured in antique white marble this Aged Marble Pegasus Fountain has been inspired from mythical greece, where artisans first brought the enchanting greek mythology to life in massive hand carved marble structures. Dimensions: H: 96" W: 144" D: 144" View Colors Call Us! This stunning piece of art is ideal for the front entrance of a home, adding intrique and beauty as a welcome for all guests. 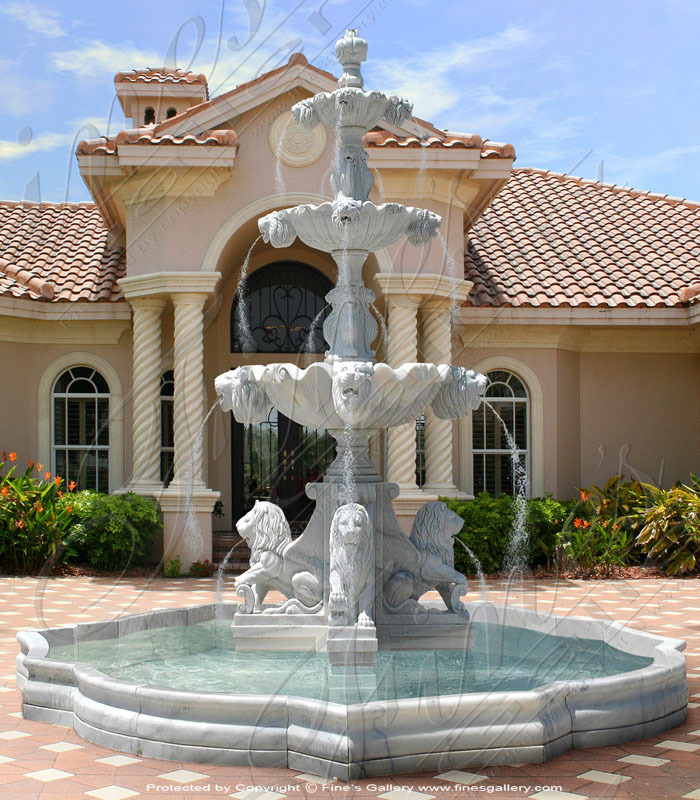 This design features sculpted mythical creatures including winged lions at the base. . 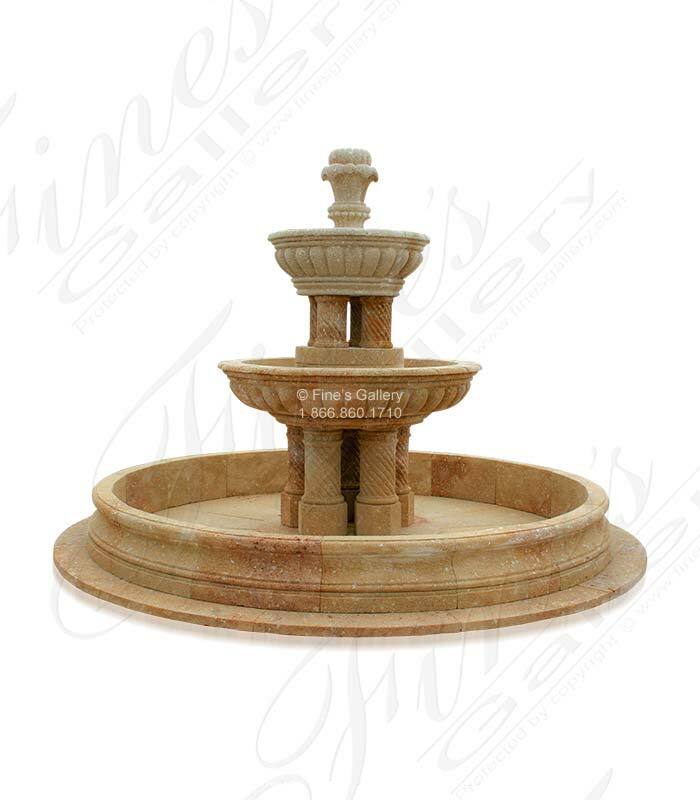 This Oversized Traditional Travertine Fountain is a Luxurious natural stone wonder. 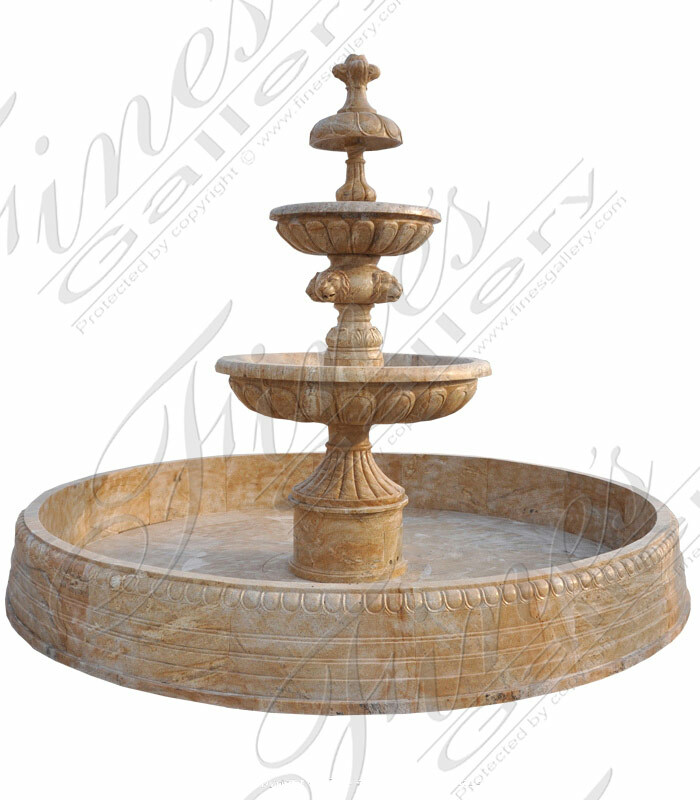 Carved from light travertine with smooth finish. 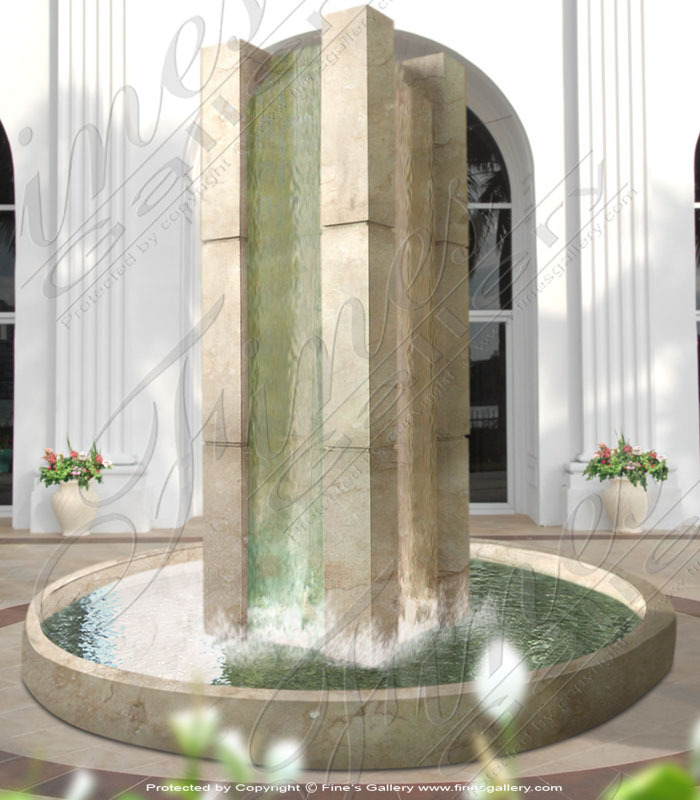 The bulky construction of this fountain provide wow factor for any upscale residence. 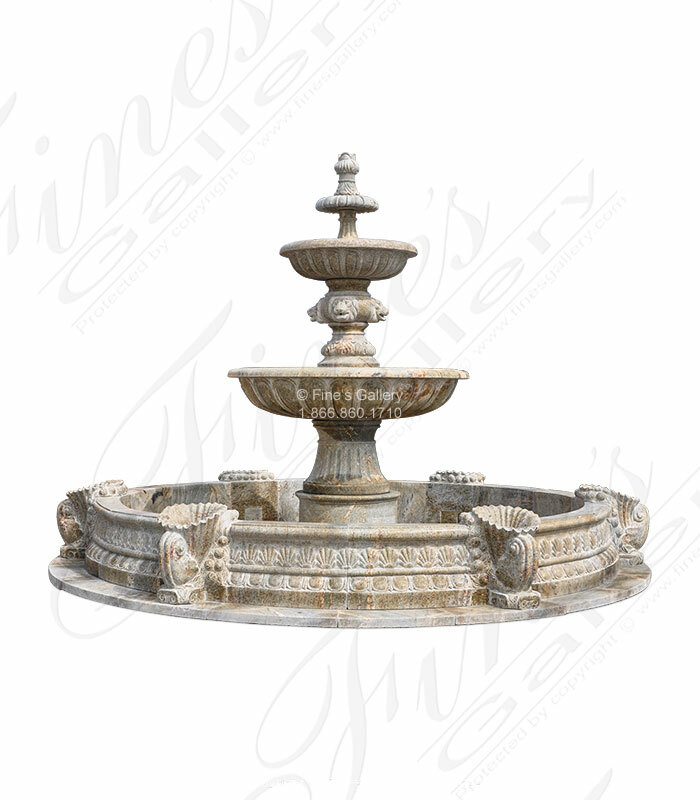 Dimensions: H: 122" W: 198" D: 198" View Colors Call Us! 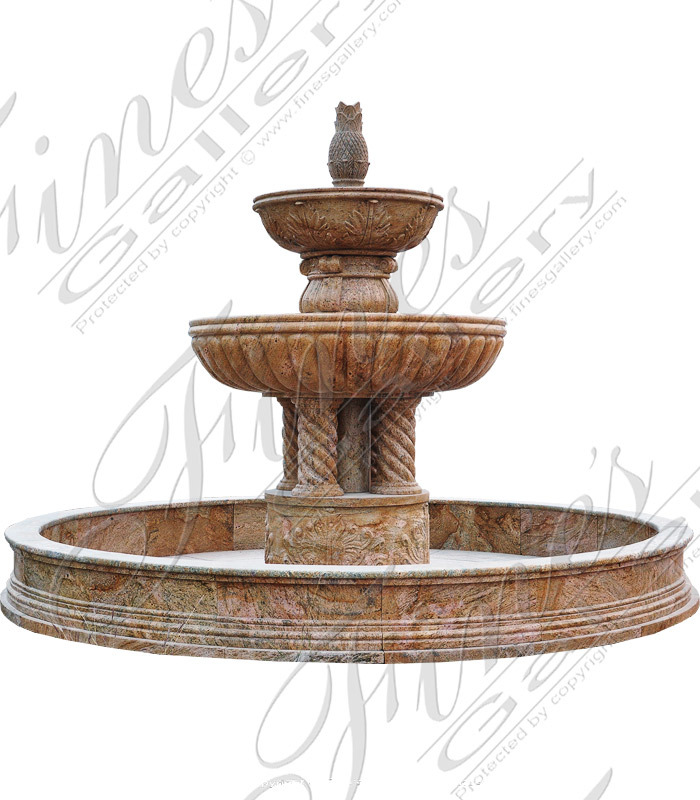 Dimensions: H: 131" W: 168" D: 168" View Colors Call Us! 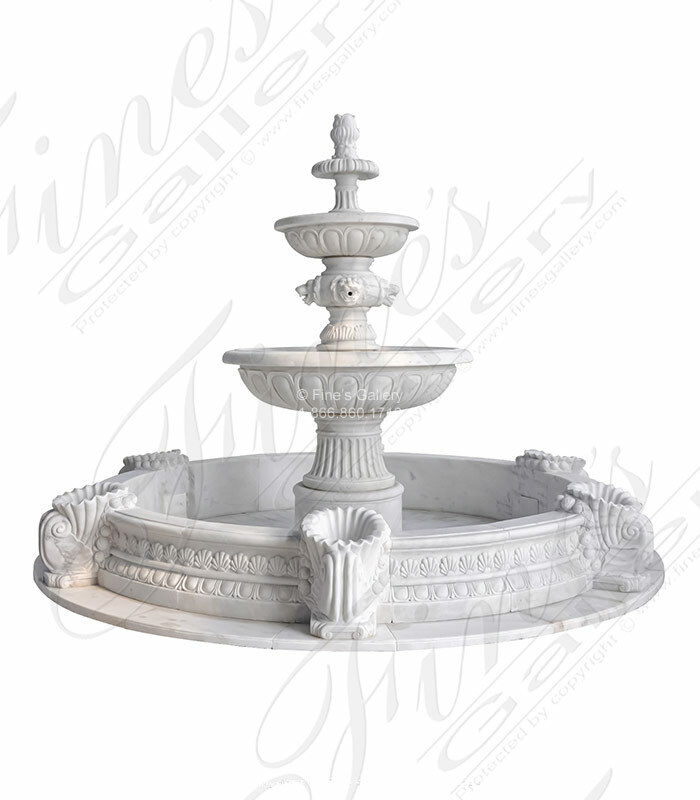 A classic three tiered style City Park fountain in White Marble. Installed at a commercial jobsite in Florida. 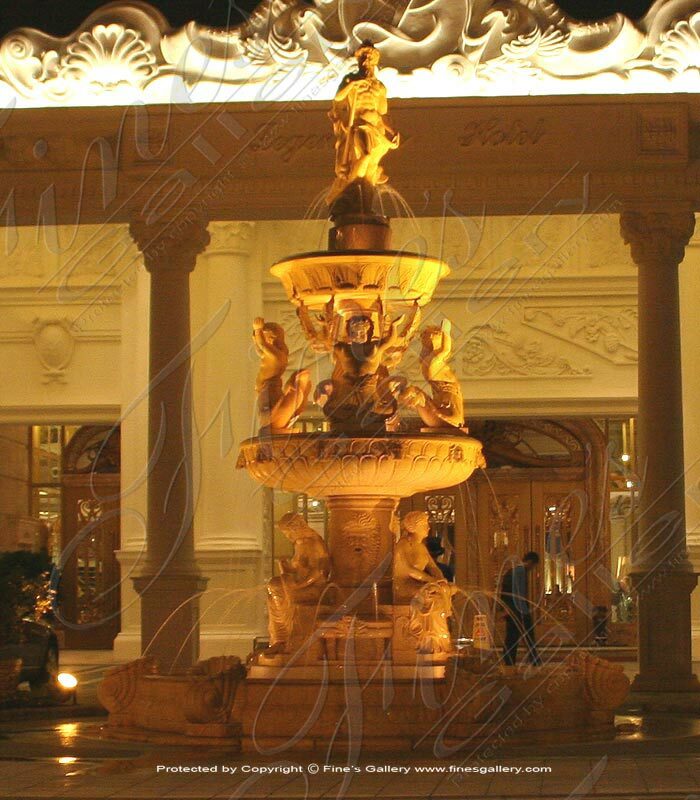 The natural beauty and durability of marble is unmatched by cast, concrete or any inferior material! Available in Granite or travertine. 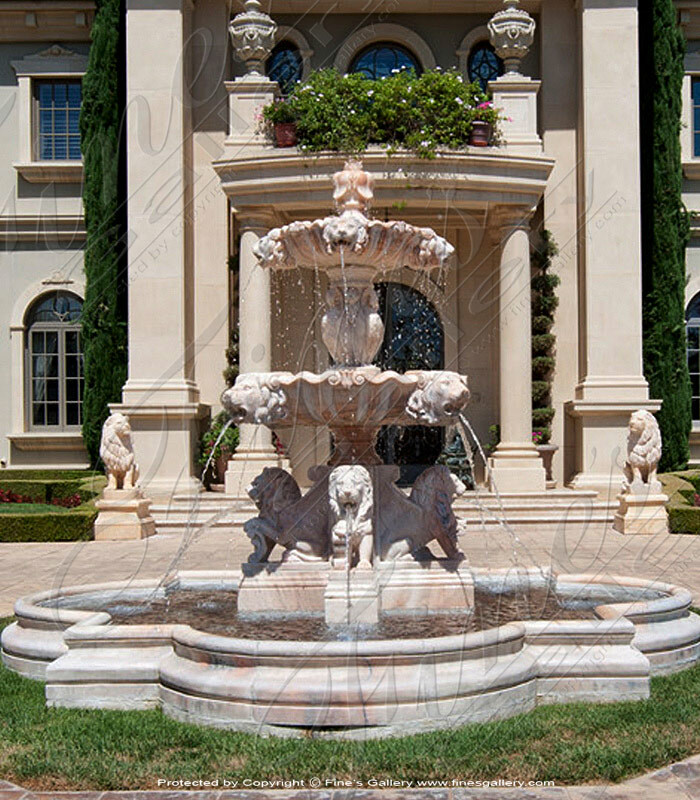 Stunning Italian marble fountains. 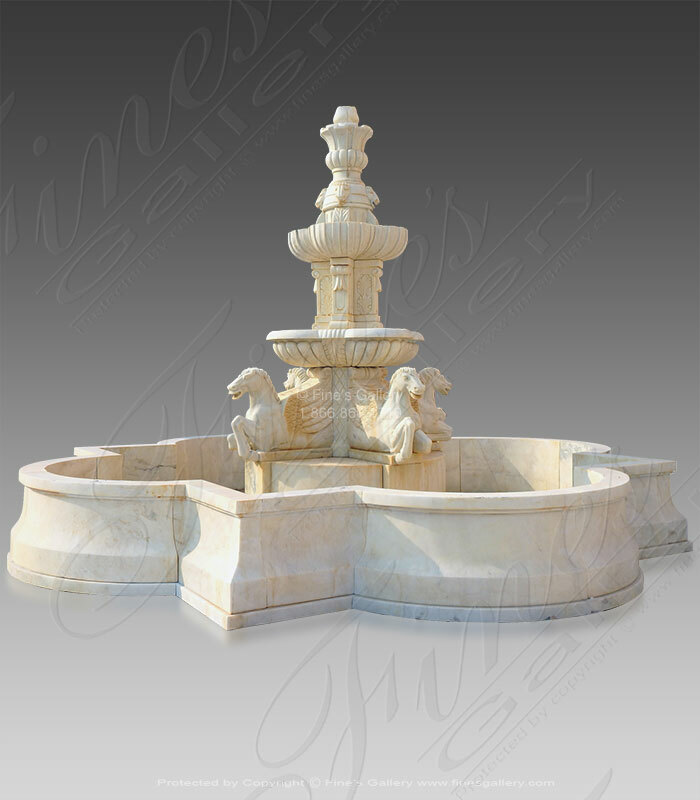 This piece is carved from rare exotic imported italian marble. Dimensions: H: 73" W: 88" D: 88" View Colors Call Us! 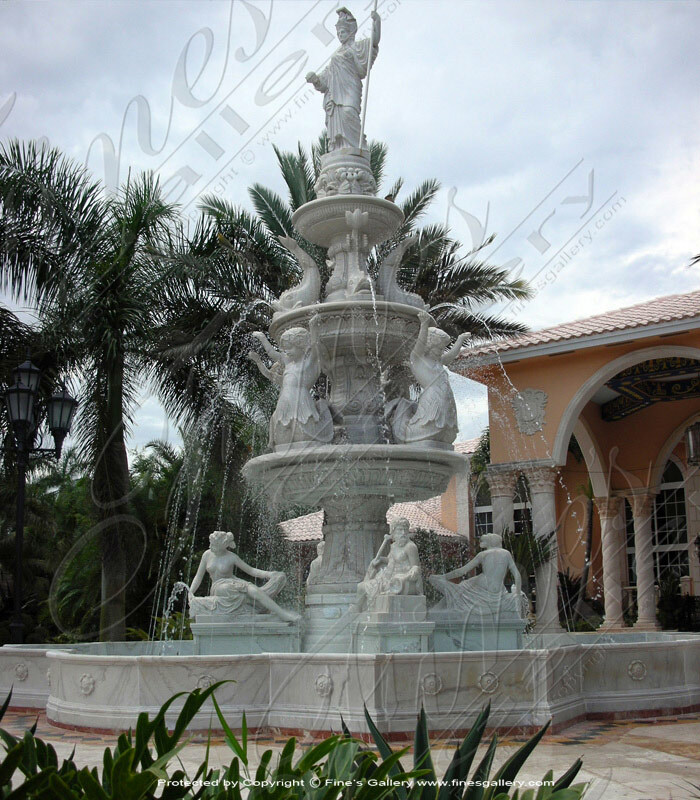 Four Pegasus Tiered Marble Fountain featuring scalloped edge fountain tiers, cornicopia shells which spout water to center of the fountain and hand carved pegasus horse sculptures. Dimensions: H: 118" W: 157" D: 157" View Colors Call Us! 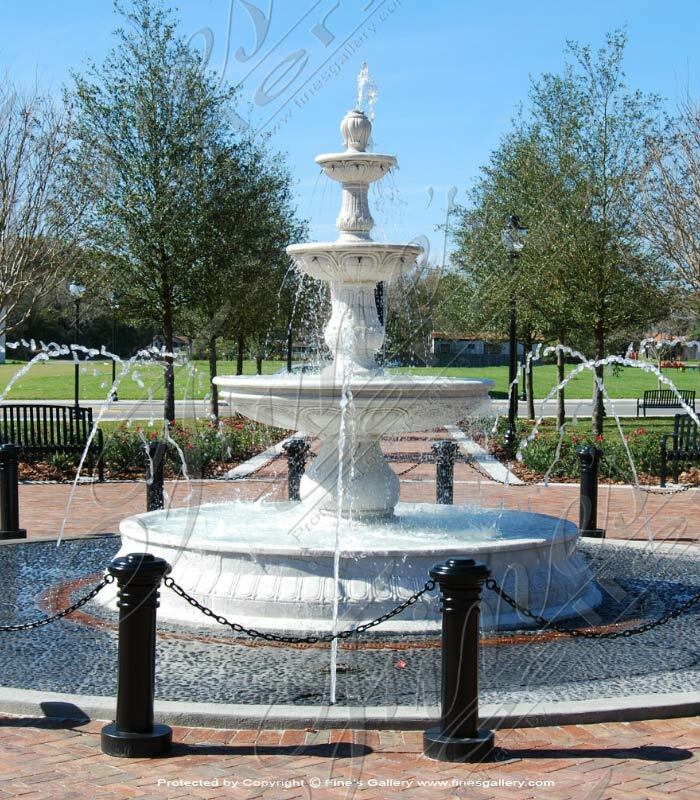 Installed in Houston TX, This stunning Granite Motor Court Fountain is awe inspiring. 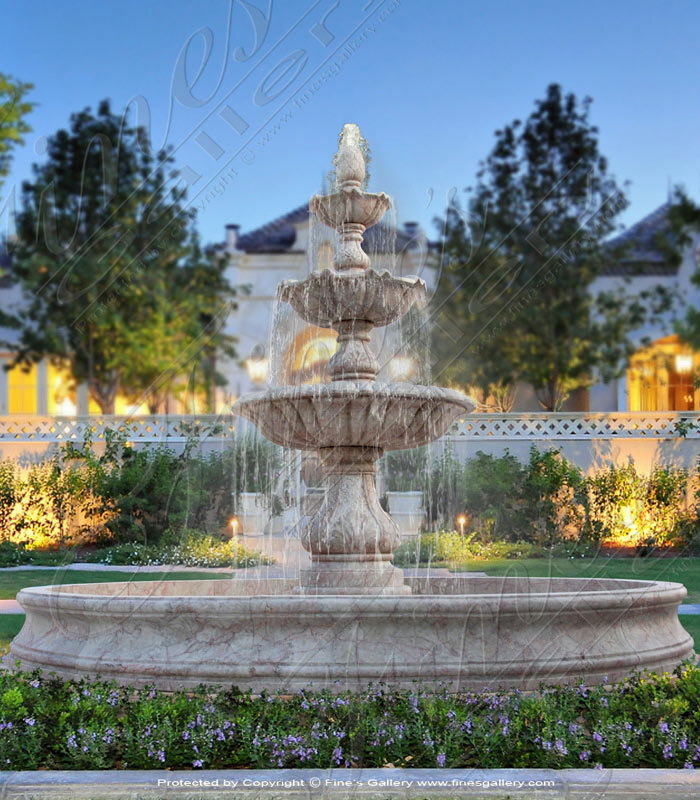 Installed with LED lighting and a high volume of water for amazing water fall effect both day and night. National turn key delivery & installation! Dimensions: H: 84" W: 144" D: 144" View Colors Call Us! 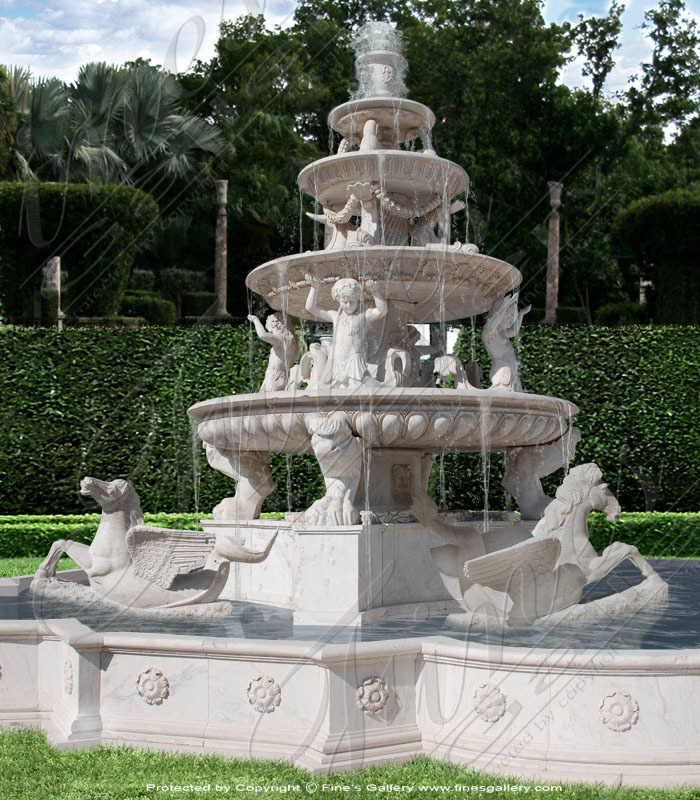 This three tier marble fountain is carved from a unique marble type. This is available for a limited time only. 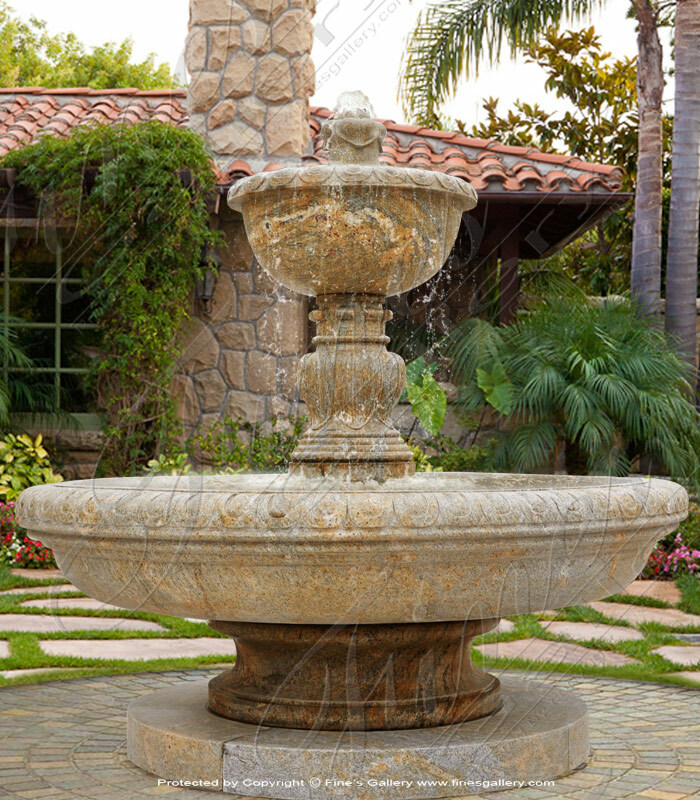 Included is the pool surround and three tiered fountain featuring scalloped bowls for a traditional look. Dimensions: H: 94" W: 117" D: 117" View Colors Call Us! 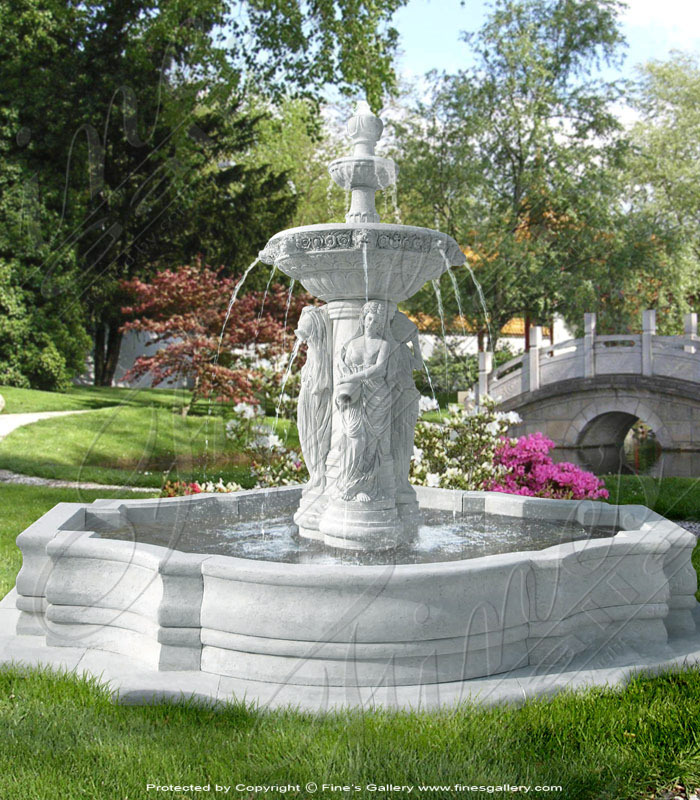 Carved from 100% natural solid granite. 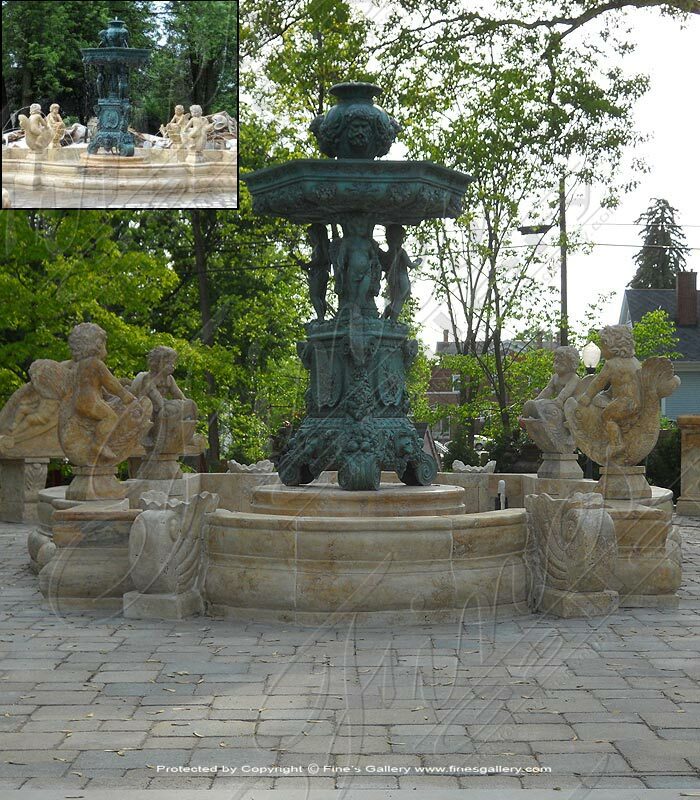 This fountain features a detailed quatrefoil shaped pool surround on top of a circular granite pad, spiral columns, high relief throughout and a quintuple bubbler which cascades for outstanding water effect. Dimensions: H: 58" W: 120" D: 120" View Colors Call Us! 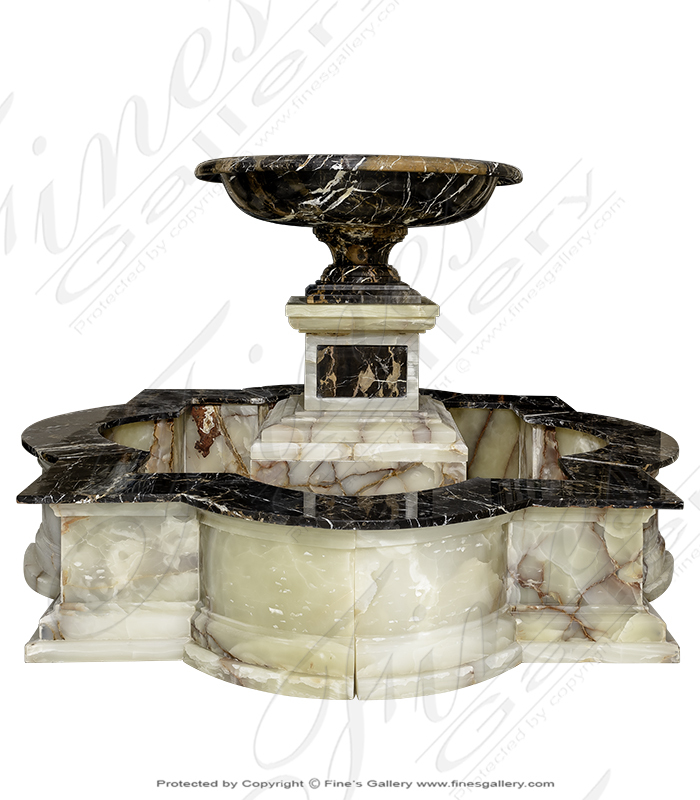 A Luxurious black and white marble fountain carved from the breathtaking Michelangelo marble and white onyx. 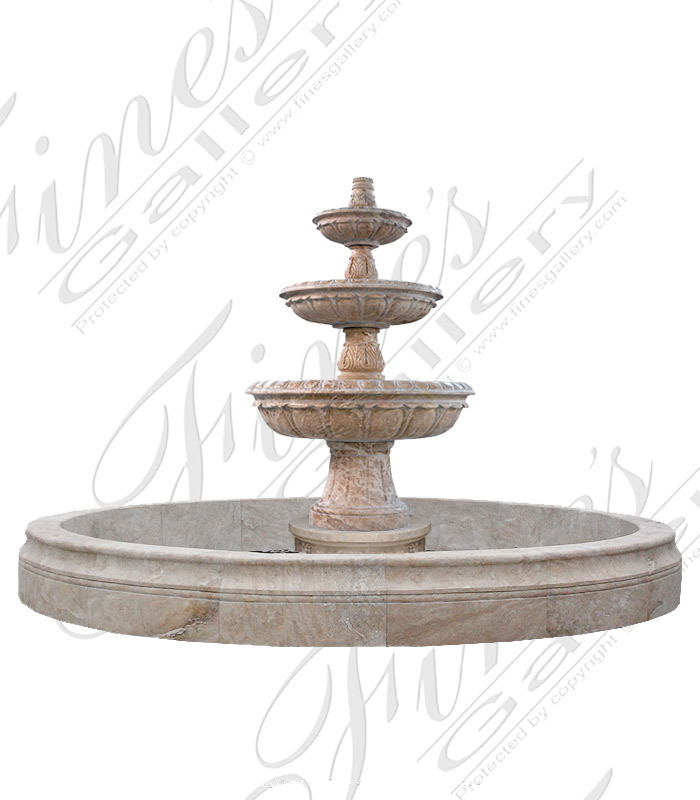 A stunning one tiered fountain with quatrefoil shaped pool basin. 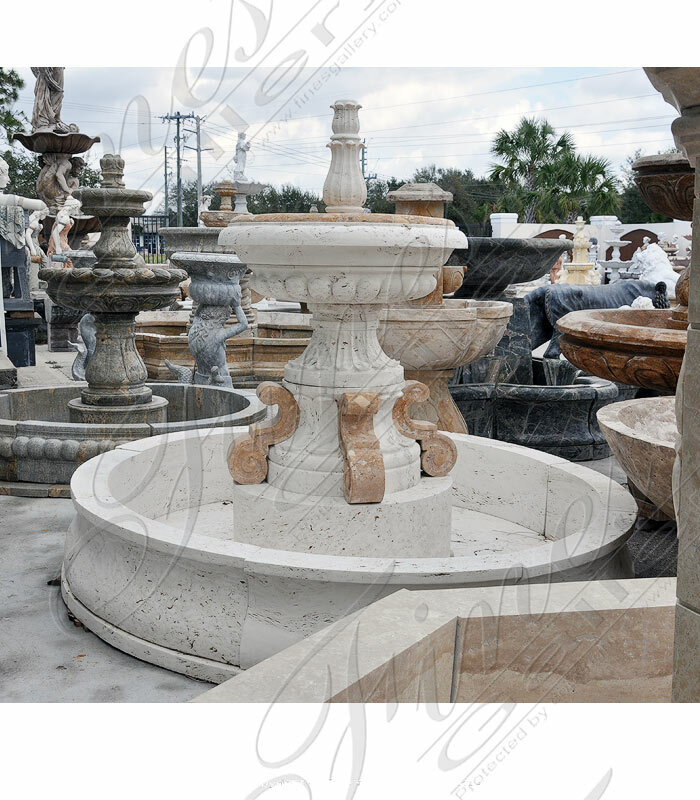 Choose from an endless array of marble and granite color combinations. Dimensions: H: 43" W: 72" D: 72" View Colors Call Us!